Wiesel has also served as chair of the board of the Aaron Diamond AIDS Research Center (1995–2001), president of the Society for Neuroscience (1978–1979), and the International Brain Research Organization (1998–2004). He was chair of the board of governors of the New York Academy of Sciences (2001–2006); and he was the academy's chairman and interim director in 2001-2002. Wiesel sits on the President's Council at University of the People. Hubel and Wiesel were awarded the Nobel Prize in 1981 for their work on ocular dominance columns in the 1960s and 1970s. By depriving kittens from using one eye, they showed that columns in the primary visual cortex receiving inputs from the other eye took over the areas that would normally receive input from the deprived eye. These kittens also did not develop areas receiving input from both eyes, a feature needed for binocular vision. Hubel and Wiesel's experiments showed that the ocular dominance develops irreversibly[verification needed] early in childhood development. These studies opened the door for the understanding and treatment of childhood cataracts and strabismus. They were also important in the study of cortical plasticity. ^ a b Hubel, David; Wiesel, Torsten (2012). "David Hubel and Torsten Wiesel". Neuron. 75 (2): 182–184. doi:10.1016/j.neuron.2012.07.002. ISSN 0896-6273. PMID 22841302. 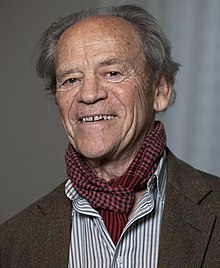 ^ a b "Professor Torsten Wiesel ForMemRS". London: Royal Society. Archived from the original on 11 November 2015. ^ a b c d e f g h i j k l m n o "Torsten N. Wiesel - Biographical". Nobelprize.org. Archived from the original on 9 July 2015. Retrieved 6 September 2015. ^ Shatz, C. J. (2013). "David Hunter Hubel". Nature. 502 (7473): 625. doi:10.1038/502625a. PMID 24172972. ^ Hubel, D. H.; Wiesel, T. N. (1959). "Receptive fields of single neurones in the cat's striate cortex". The Journal of Physiology. 148 (3): 574–591. doi:10.1113/jphysiol.1959.sp006308. ISSN 0022-3751. PMC 1363130. PMID 14403679. ^ Hubel, D. H.; Wiesel, T. N. (1962). "Receptive fields, binocular interaction and functional architecture in the cat's visual cortex". The Journal of Physiology. 160 (1): 106–154. doi:10.1113/jphysiol.1962.sp006837. ISSN 0022-3751. PMC 1359523. PMID 14449617. ^ Voneida, T. J. (1997). "Roger Wolcott Sperry. 20 August 1913--17 April 1994: Elected For.Mem.R.S. 1976". Biographical Memoirs of Fellows of the Royal Society. 43: 463–470. doi:10.1098/rsbm.1997.0025. ^ Berlucchi, Giovanni (2006). "Revisiting the 1981 Nobel Prize to Roger Sperry, David Hubel, and Torsten Wiesel on the occasion of the centennial of the Prize to Golgi and Cajal". Journal of the History of the Neurosciences. 15 (4) (published December 2006). pp. 369–75. doi:10.1080/09647040600639013. PMID 16997764. ^ Shampo, M A; Kyle, R A (1994). "Torsten Wiesel--Swedish neurobiologist wins Nobel Prize". Mayo Clin. Proc. 69 (11) (published November 1994). p. 1026. doi:10.1016/s0025-6196(12)61367-6. PMID 7967753. ^ Korczyn, A (1981). "[Nobel prize winners in medicine--1981 (Torsten Wiesel, David Hubel)]". Harefuah. 101 (12) (published 15 December 1981). pp. 378–9. PMID 7042494. ^ Prasanna, Venkhatesh V (2011). "Do we learn to see?". Resonance: Journal of Science Education. 16 (1) (published 12 January 2011). pp. 88–99. doi:10.1007/s12045-011-0013-4. ^ Angier, Natalie. "Acting President of Rockefeller U. to Stay at Least 3 More Years," New York Times. 21 February 1992; Sengupta, Somini. "Princeton Cancer Expert Is New Rockefeller U. President," New York Times. 1 July 1998. ^ Overbye, Dennis. "New York Academy of Sciences Elects a New Chief Executive," New York Times. 19 November 2002. ^ "Torsten N. Wiesel - Our Scientists". Our Scientists. Retrieved 27 September 2018. ^ "David Rall Award Recipients". iom.nationalacademies.org. Archived from the original on 11 November 2015. Retrieved 21 October 2015. ^ a b National Eye Institute: "NEI Grantees Receive National Medals of Science," Archived 2009-09-24 at the Wayback Machine 2007. ^ Emma Marris (14 July 2004). "Bush accused of trying to foist favourites on health agency". Nature. 430 (281): 281–281. doi:10.1038/430281a. PMID 15254502. ^ a b "Torsten N. Wiesel - Facts". nobelprize.org.